On this date in 1944, just days after the Liberation of Paris secured the restoration of the French Republic, six collaborators were publicly shot in the foothills of the French Alps. They were the condemned of the first court-martial to sit in liberated France. A London Times correspondent estimated that 4,000 or more of their countrymen braved cruel wind and rain to cheer the traitors’ deaths meted to these young members of the Vichy government’s hated milice. They were among ten members of that militia captured at a training grounds in Grenoble, and the shooting of these six was preceded by a loudspeaker announcement decrying the tribunal which tried them for having the softness merely to imprison the other four. “The Liberation Committee considers that the sentences which failed to inflict the death penalty on all the militiamen not to be in conformity with the wishes of the French people and accordingly promises, in conformity with those wishes, to see that the composition of the court-martial is revised in order to avoid a repetition of such weakness.” The people answered with a cheer. 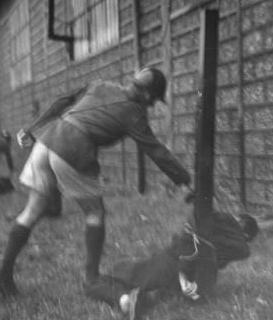 The executions, carried out on a grounds the Gestapo had once used to executed Resistance members, were also photographed, and the striking images published in the Oct. 2 issue of Life magazine. Once available online from Life at this now-dead link, the gallery is reproduced at this Chinese page; Warning: Disturbing Content. Photographer John Osborne, later a noted editor and habitue of Richard Nixon’s enemies list, would not have been a candidate for the Resistance’s court.